DJ Debbie and Anne Wanjie present a wide range of music from Africa and the wider diaspora. 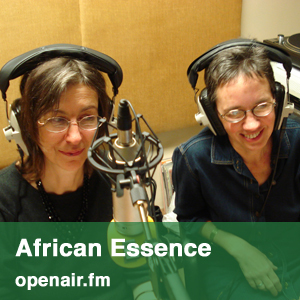 Debbie Golt and Anne Wanjie bring their extensive radio experience from the legendary gaialive.com, Resonance fm and Radio Verulam, to this hour long show featuring an eclectic mix of African music from all destinations. Selections range from remixes and prereleases, to classic recordings from specific musical traditions. They have a keen ear for UK-based artists, holding interviews from key movers and shakers on the music scene, as well as from acclaimed artists and cultural experts. This week features a studio interview with award winning actor Jimmy Akinbola (Recently starred in Othello), as well as music by the great lady of taarab, Bi Kidude, and Dub Collosus. Another all-star lineup including music from Toumast, Stella Chiweshe and a special Interview with Chiwoniso recorded at Momo's. Music from the late Myriam Makeba, followed by Angolan artists Waldemar Bastos and Bonga among others. This weeks mix features Moroccan Reggae, Chadian singer Mounira Mitchala, and Malian star Rokia Traore. This show also includes a special pre-recorded interview with Soul?ymane Sy Savan?, lead actor in the film 'Goodbye Solo.